Is tradition important in the worship of Isis? For me, there isn’t a yes-or-no answer to this question; rather, there’s a yes-and-no answer. Without tradition, where do we even begin to think about Isis? How can we know Who She is for us if we don’t know Who She was for those who went before us? Without tradition, we have nowhere to begin as we try to come into relationship with Her. Without a knowledge of the symbols traditionally associated with Her, the stories traditionally told about Her (at least the ones of which we have records), how do we know we’re contacting Isis rather than a more generic Divine Feminine? Indeed, we may feel truly called to Isis as Isis—even without indepth study of ancient Egyptian religion and traditions. But then what do we do? How can we honor the Goddess Who calls us in a way that is most pleasing to Her? How can we honor Her in a way that will help us succeed in our heart’s desire of coming to know Her? Tradition is our savior in this. Tradition provides the deep roots of our worship. It gives us an anchor for our modern love of Isis. Suddenly, we have a way to feel close to Her. We can learn and interpret Her myths. We can give Her the offerings that were traditionally given to Her. If we are of a scholarly bent, we might learn a bit about hieroglyphs so that we might write Her name in the ancient ways. 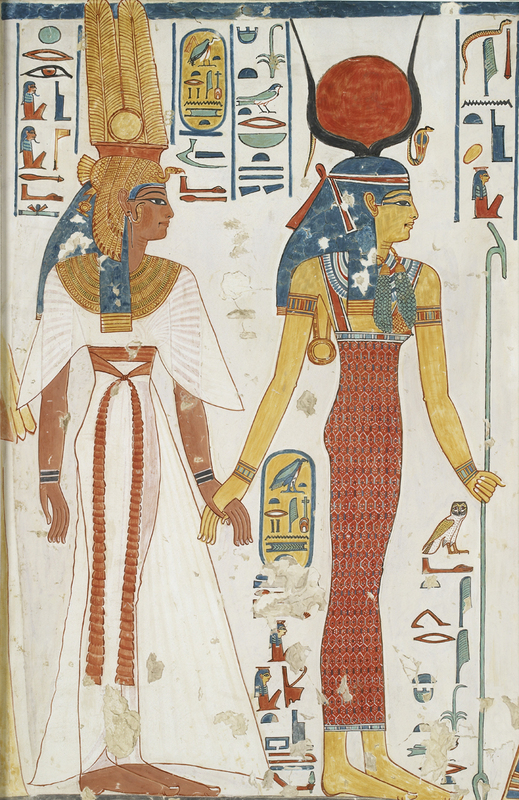 We can use excerpts from the ancient Egyptian sacred texts in our rites. With Isis, we are blessed for there is a wealth of information available about Her (and no, I don’t mean just the Isis Wikipedia entry that is reposted ad nauseam on sites all over the internet). Books are our friends. Scholars who never worshipped the Goddess, but who have done the research Isis worshippers need, are our friends. If you’re a crazy-serious Isiac like me, interlibrary loan is your friend. What’s more, since there are no direct ancient Egyptian initiatory traditions that survive today, learning about Isis’ ancient worship serves that purpose—at least in a small way. It connects us to our chosen past. It connects us to our chosen Goddess. But tradition should not constrain us. Ancient rites are not Her only rites. Tradition provides the anchor and the roots, not the sails and the flowers. Thousands of years have passed since Isis’ name was first spoken in praise by human beings. We have changed. We shall continue to change. And that means that our experience of the Goddess can never be exactly the same as our ancient sisters and brothers. So while our understanding of the Goddess begins with the roots of tradition, it continues with the flowering of our own experience of Her. She may show us new symbols that pertain to Her. (For instance, I think there is very good reason to consider Isis as the Digital Goddess; indeed, more than one software company bears Her name.) We cannot be content to only recite the ancient sacred texts. We must write our own. And many are the Isiacs who have expressed their modern understanding of the Goddess in new poetry, or prose, or prayer. We hold Isis in our hearts today; as She holds us. As usual, my answer is “both-and,” not “either-or.” It is, I believe, a more difficult—because more ambiguous—answer. Yet for me, it is the more truthful answer. We need both tradition and innovation. If we are to be true Isiacs, then we need to know about Her past. If we are to be Her true devotees, then we need to be Her present. We need to carry Her love and Her power and Her wisdom and her magic forward….into tomorrow. Hi Isidora – I like especially your comment “Tradition provides the anchor and roots, not the sails and flowers.” I’ll think of myself as a Flower of Isis from now on and more specifically a Red Poppy of Isis! PS I was interviewed by someone on a radio blog who I now realize probably got her Isiac information from Wikipedia…a place I’ve never thought of going for Isis knowledge! Oh you are most definitely a Flower of Isis, Isis-sista! Love the red poppy, too. I think you’ll enjoy The Harmony of Isis, my newly released novel that connects Isis to our modern world in a really cool way. If you search youtube, you can see the video release I just made in front of the pyramids, and on Amazon you can see the full blurb for the plot. It’s my sincere hope this novel brings female-energy worship back to the mainstream where it belongs.